On February 19, 2010 - On Wednesday the Office of Inspector General (OIG) issued its report on the Federal Aviation Administration's (FAA) oversight of American Airlines’ maintenance programs. The audit was prompted by allegations that the overall aircraft operational reliability had decreased at this airline. The audit objectives were to assess (1) FAA’s oversight of American Airlines’ maintenance program and identify any underlying weaknesses and (2) FAA’s response to the allegations. OIG reported that FAA’s oversight lacked the rigor needed to identify the types of issues identified in the allegations, at least 4 of which were found to be valid. Specifically, FAA failed to assess systems for monitoring air carrier maintenance programs, identify root causes of maintenance deferrals, ensure properly trained mechanics performed certain required inspections, and ensure prompt responses to safety recommendations and service bulletins. In addition, FAA’s internal reviews of the allegations were not comprehensive. As a result, FAA missed opportunities to identify potential maintenance issues and put corrective actions in place. OIG recommended several actions to enhance FAA’s oversight in key maintenance areas at American—such actions could also improve FAA’s maintenance oversight at other air carriers as well as its processes for assessing industry-wide safety allegations. FAA generally concurred with the recommendations; however, many of the actions FAA has taken are still underway. Therefore, OIG has requested additional information to validate that the issues identified have been fully addressed. 13 days prior to the flight, the aircraft’s left engine air turbine starter valve had been replaced six times in an effort to address an ongoing problem with starting the engine using normal procedures. None of the valve replacements solved the engine start problem, and the repeated failures to address the issue were not recognized by the airline’s CASS personnel. According to the NTSB, if these maintenance discrepancies had been found, the engine fire could have been prevented. First, OIG confirmed the allegation that American Airlines’ maintenance-related events have increased. February 28, 2008, Allegations Against American Airlines: Maintenance-related delays, cancellations, and diversions have increased. • Minimum Equipment List (MEL) deferrals have increased, and MEL authority has been abused. • A Boeing service bulletin that could have prevented some cockpit windshield failures was not implemented. • Certain Functional Check Flights (post-maintenance test flights) were eliminated. • Maintenance check intervals were changed, resulting in fewer maintenance checks. • Spare parts inventories were reduced. • Required inspections of an aircraft repaired after a September 2007 engine fire were performed by a non-qualified mechanic. • Computerized maintenance records were inadequate. • Maintenance records were not transparent. • Retribution was taken against personnel who have reported maintenance problems. 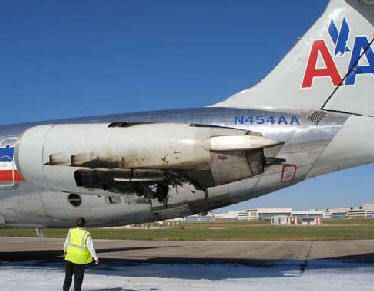 Further, the National Transportation Safety Board (NTSB) recently found that American’s Continuing Analysis and Surveillance System (CASS)—a system intended to monitor and analyze the performance and effectiveness of a carrier’s inspection and maintenance programs—failed to detect repeated maintenance discrepancies, which, if found, could have prevented an in-flight engine fire that occurred in September 2007. However, during a 2-year period between 2005 and 2007, FAA did not perform required routine surveillance of American’s CASS and reliability programs—two key systems for monitoring carriers’ maintenance programs. While FAA reviewed the carrier’s policies and procedures governing the two systems, it did not determine whether the carrier actually followed them. Second, OIG confirmed the allegation that maintenance deferrals increased significantly. From 2004 through the first 5 months of 2008, American’s number of open maintenance deferrals increased by 32 percent, from an average of 298 per day to an average of 394 per day. Despite this increase, FAA only tracked the number of deferrals but did not identify the types of aircraft parts being deferred or the causes of the deferrals. As a result, FAA inspectors missed opportunities to identify potential fleet-wide maintenance issues and put corrective action plans in place. Third, OIG confirmed the allegation that American was not following procedures for required maintenance inspections. OIG found that FAA has not taken appropriate action to address American’s longstanding failure to comply with required maintenance inspection procedures. In late 2005, FAA initiated a System Analysis Team, which made 35 recommendations to improve American’s compliance, but corrective actions for the team’s recommendations made in 2006 are still not complete. In December 2007, inspections of repairs made to the aircraft damaged during an in-flight engine fire were performed by a technician whose qualifications had expired—a deficiency that was not discovered until the aircraft was ready to depart with passengers. Following this incident, FAA requested that American submit a comprehensive corrective action plan within 20 days. In September 2008—9 months after FAA’s request—American submitted its plan and is continuing its efforts to implement FAA’s 2006 recommendations. Finally, OIG confirmed the allegation that American did not implement a Boeing service bulletin2alerting carriers to problems with aircraft windshield heating systems that could cause the windshield to crack or shatter if left uncorrected. FAA did not identify process weaknesses in American’s maintenance and engineering programs that resulted in the carrier’s failure to perform planned inspections of Boeing 757 windshield heating systems. Further, FAA has yet to finalize and issue an airworthiness directive that would require carriers to address the windshield heating problem—a recommendation NTSB made in 2004. To assess the February 2008 allegations, FAA undertook two reviews. One review was conducted by the CMO for American about 1 month after the allegations were submitted. The other review was conducted by FAA inspectors from outside the CMO utilizing an Internal Assistance Capability (IAC) process to independently review the February 2008 safety allegations. Based on OIG findings, OIG is making several recommendations to enhance FAA’s oversight in key maintenance areas at American and improve its processes for assessing safety allegations.